If he were white, Bigger Thomas, the main character in Richard Wright’s Native Son, would be called a classic anti-hero. He makes bad decisions, and he kills women, both accidentally and deliberately. In the hard scrabble streets of 1930s Chicago, Bigger schemes a heist he’s unable to pull off and, for much of the novel, runs from the law and then, arrested, finds a defender. But in making this character an African-American struggling with the harsh conditions furnished by endemic racism and the perpetuation of a hapless underclass, Wright’s great contribution to American literature was finding a way to make such a person become a figure for cathartic portrayal. Bigger’s struggle, while still making us uneasy as anti-heroes do, is a heroic confrontation with a criminal status quo. Adapted for the stage by Nambi E. Kelley, first at Chicago’s Court Theatre and now playing at the Yale Repertory Theatre, Native Son presents Bigger Thomas (Jerod Haynes, reprising the role he has played in two previous productions) as a man rather passively accosted by harsh fate. Things start badly—we see him unwittingly kill his employer’s daughter out of fear of discovery before we even grasp the situation—and then get worse in a wrenching downward spiral that Kelley and director Seret Scott, who has helmed all three productions, make us ride with Bigger in a swift 90 minutes to an inevitable end. The play’s most marked feature is its compression. The action on stage recreates the non-linearity of Bigger’s recollections and fantasies interleaved with the inexorable events that overtake him. Kelley’s text depends on lightning-fast changes, where a phrase ending one scene might be the start of the next, and where action overlaps and reactions can stretch between scenes. It’s incredibly compelling and mostly flawless in its execution by a cast that works hard to keep the different trains running. Striking features of the show include Ryan Emen’s set, comprised of towering tenement buildings with fire escapes; Stephen Strawbridge’s lighting, a carefully calibrated mix of film noir, naturalism, and expressionism; and sound designer/composer Frederick Kennedy’s moody use of jazz music together with crucial sound effects—pool balls, car doors, a crunching skull. It’s a dark play and the Yale Rep production skillfully renders this particular hell. The interplay of Bigger, who Haynes plays as a strong, brooding type, with The Black Rat, a cynical pragmatist, sustains the play’s development, as most of the other interactions are more emblematic than deliberated. For instance, Mrs. Dalton (Carmen Roman, another veteran of the play), is a blind rich lady who employs Bigger as a chauffeur. She tries to appear sympathetic to Bigger despite the fact that she’s complicit, through real estate holdings, with the harsh conditions of the Thomas family and their neighbors. She’s blind both literally and figuratively. Scott and Kelley let characters be the types Bigger sees them as. An awkward flashback shows Bigger driving Mary (Louisa Jacobson), flapper-ish heiress of the Daltons, and her well-intentioned but condescending Communist beau Jan (Joby Earle, earnest). The couple’s effort to affect camaraderie with their servant makes Bigger uncomfortable and earns the Black Rat’s scorn. Other characters are mostly used for stock antagonisms: Michael Pemberton plays Britten, a detective whose casual racism makes him assume that Bigger, even if guilty, must have had a white accomplice for such a complex crime, and also a police officer who visits a more violent racism upon the Thomas family. The scene’s brutality is echoed in many of Bigger’s actions, such as bullying his brother Buddy (Jasai Chase-Owens), and in his treatment of hapless Bessie, a woman who sees through his lies at her own peril. Such scenes seem to function as asides; the main tensions of the play are contained in Bigger’s guilt and flight. The scene in which Bigger tries to rid himself of Mary’s body is harrowing in its stark necessity but also grimly comic. Haynes, who generally maintains a tone of barely mastered panic, tries to brazen it out and we find ourselves wishing that, just once, things would go his way and let Bigger outsmart someone. 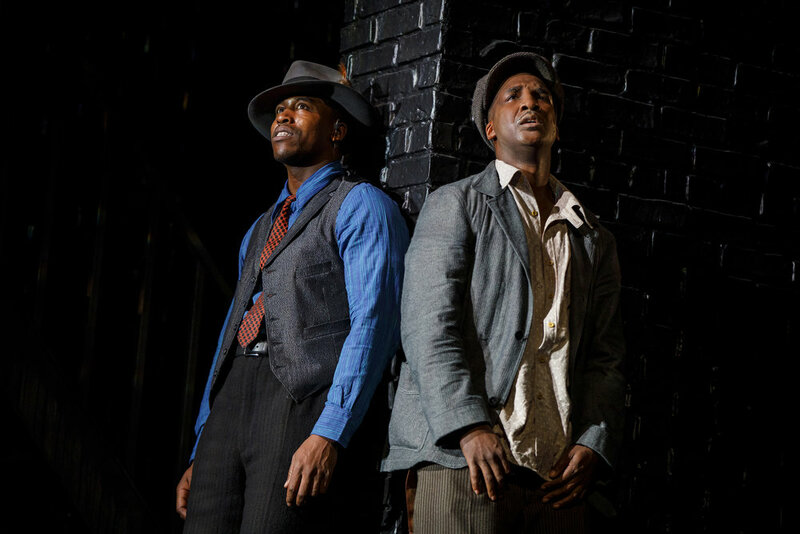 Theatrically varied and energetic in its approach, Native Son demands and repays the attention of audiences serious about theater and the need to tell difficult stories.